LONDON – Grinning like the Nashville cat that got the cream, Albert Lee showed up just often enough to lighten the mood in a long and surprisingly sober Wembley Arena charity concert by top guitarists called the Miller Strat Pack to celebrate the 50th anniversary of the Fender Stratocaster. 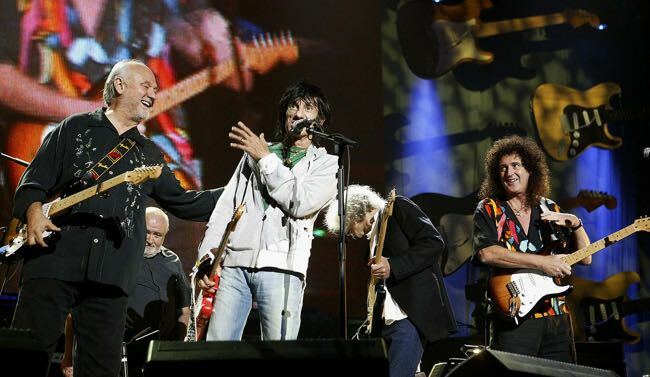 Jeff Beck, one of the billed headliners, withdrew “due to unforeseen difficulties”, organizers said, but heavy-duty rockers on hand included Pink Floyd’s David Gilmour, Queen’s Brian May, the Eagles’ Joe Walsh, Roxy Music’s Phil Manzanera, Mike Rutherford from Genesis and Ronnie Wood from the Rolling Stones. The Crickets kicked off the almost three-hour show, which benefited the Nordoff-Robbins Music Therapy Centre, in very lively fashion. Guitar player Sonny Curtis (pictured with Wood, Lee and May) took vocal duties on songs that he and drummer J.I. Alison wrote with Buddy Holly – “Oh, Boy”, “Maybe Baby”, “More Than I Can Say”, ”Every Day”, and “Peggy Sue” as Albert Lee chimed in. Curtis sang his own “I Fought the Law” and May took over for the Holly classic “That’ll Be the Day” as Ronnie Wood lent a hand. The pace slowed down as Hank Marvin of the Shadows played five of his best-known instrumentals including the hypnotic “Sleep Walk” and his biggest hit, “Apache”. Smiling and relaxed, playing beside his guitarist son Ben, Marvin was received deliriously by the 10,000 crowd and he had the best line of the night: “Thank you all for coming along to support a very worthy cause. Old men”. There were lots of gray and balding heads in the audience but no less fervent for that as, to contradict Marvin, out came New Orleans-based blonde Swedish singer/violinist Theresa Andersson to declare: “I’m On My Way” with Lee. The smiling Englishman raised the bar on picking expectations with a glorious performance of Ricky Skaggs’ “Country Boy,” his long white hair as still as his flying fingers were fast. Mike Rutherford followed, accompanied by Paul Carrack from Ace, as they played respectful tributes to Jim Hendrix with “All Along the Watchtower” and George Harrison with “While My Guitar Gently Weeps”. They added the Genesis track “I Can’t Dance” and Ace’s “How Long (has this been going on? )” for good measure. But then Belfast-born Gary Moore blew the roof off with a long, outstanding barrel-house rendition of Hendrix’s “Red House”. After a break, singer/pianist Jamie Cullum volunteered his version of Hendrix’s “Angel”, and Amy Winehouse offered “Out of the Box” and “Stranger than Me”. Paul Rodgers, of Free and Bad Company, who was in fine voice, lit the house on fire with a vigorous set that included “Muddy Water Blues” and “Drinking”. Brian May provided a guitar solo for Free’s anthem “Alright Now”, which prompted a standing ovation, and then Joe Walsh stepped in to play on Bad Company’s “Can’t Get Enough”. The Eagles man, who appeared tired but played well and got a big hand, stayed on to perform “Life’s Been Good”, “Life in the Fast Lane”, “Lucky Mountain Way” and “Funk 49”. 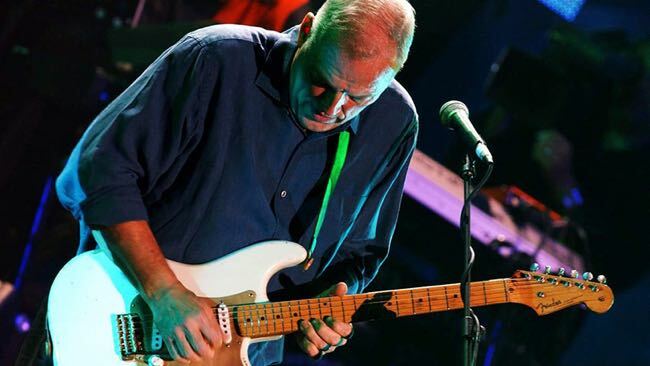 Soberly dressed Phil Manzanera did his “6PM” and stepped back to allow the very serious David Gilmour (pictured above) to take center stage for “Marooned” and “Coming Back to Life”. Gilmour was given a rapturous reception and he delivered an epic performance of his ethereal, beseeching music, which finished with the subterranean growl of “Sorrow”. Ronnie Wood was presumably booked to top off the show with some typical Stones good times but the rocker perversely came on without a hard-bodied guitar for a lackluster performance of “Ooh La La,” in which he was saved by the backup singers. The evening ended with a delivery of “Stay With Me” led by the energetic Rodgers and every picker in the show. It was a good time but the memories of Lee, Moore and Gilmour will linger longest. This entry was posted in Music, Reviews and tagged Albert Lee, Amy Winehouse, Brian May, David Gilmour, Fender Stratocaster, Gary Moore, Hank Marvin, Jamie Cullum, Joe Walsh, Mike Rutherford, Miller Strat Pack, Nordoff-Robbins Music Therapy Centre, Paul Rodgers, Phil Manzanera, Ronnie Wood, Sonny Curtis, Theresa Anderson, Wembley Arena. Bookmark the permalink.